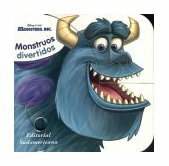 Spanish Edition Also Available For kids who just can't get enough of the hilarious Monsters, Inc. from Disney and Pixar, here's a read-aloud storybook that allows them to giggle at the antics of Mike, Sulley, and Boo over and over again. The adapted version covers all the highlights, so readers who have seen the movie can relive their favorite scenes. Remember when Boo sneaks out of the gym bag at the fancy restaurant where Mike and his girlfriend are having a romantic evening? How about when Sulley finally has to say good-bye to Boo, knowing that her door will be shredded and he'll never see her again? Sixty-four pages of full-color illustrations and read-aloud text ensure a monstrously good time. Fans won't want to miss the other exciting Monsters, Inc. titles, including Monsters, Inc. Essential Guide, Monsters, Inc. Sticker Book, and M Is for Monster. Monsters Get Scared of the Dark, Too The monsters are back and in their own storybook series! When Mike and Sulley monster-sit Mike's nephew, they discover that he is afraid of the dark. Can the two friends come up with a plan to help the little monster get over his fear and get to sleep? Find out in this 16-page book complete with a full sheet of stickers. Monsters Get Scared of Dogs, Too Monsters can get scared of dogs, just like humans. Will Mike’s fear of dogs prevent him from doing his job and making kids laugh? 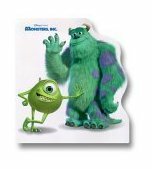 Children will laugh and learn with the stars of the hit movie Monsters, Inc., in this 8 x 8 storybook with a full sheet of stickers. Monsters Get Scared of Doctors, Too The Monsters Get Scared, Too series continues! Sulley has a bad cold and needs to get better quick so he can go back to work. But the big furry monster is afraid to go to the doctor! Will Sulley muster up the courage to get the help he needs? Find out in this 16-page storybook with stickers! Monsters Get Scared of School, Too When the employees at Monsters, Inc. have to head back to school for training, Mike is really nervous. He is worried about making new friends, meeting his teacher, and getting lost—Mike is scared to go to school! Can Mike overcome his fear and become a model student? Children will laugh and learn with the stars of the hit movie Monsters, Inc. in this storybook with stickers. (Book Plus CD) Disney/Pixar's Monsters, Inc. features the adventures of Mike, Sulley, and their friends. The collection features a 24 page beautifully illustrated storybook and one audio CD with a convenient CD hub to help keep it all together. This Read-Along Disney classic provides word-for-word narration of the story encouraging independent reading. Pixar and Disney, the team behind Toy Story, Toy Story 2, and A Bug's Life, some of the most successful animated movies ever made, now present Monsters, Inc. which is brought to life by an all-star cast, including the voices of Billy Crystal and John Goodman. Look inside to find out more about the movie that's already one of the most anticipated releases of 2001. Monsters, Inc. Sticker Book Pixar and Disney, the team behind Toy Story, Toy Story 2, and A Bug's Life, some of the most successful animated movies ever made, now present Monsters, Inc., in which a corporation of monsters collect the screams of children -- after all, monsters have to make a living, too! Now you can create your very own album of the movie with over 60 stickers of your favorite characters and scenes from Monsters, Inc.
By Pete Docter & John Lasseter With the sophisticated graphics of Toy Story, A Bug's Life, and Toy Story 2 to their credit, Pixar has become the studio to watch for brilliant animation. Their next movie, Monsters, Inc., (releasing on November 2nd) stars John Goodman and Billy Crystal as two working-class monsters whose job it is to scare children. Graphically innovative and wildly imaginative, this book takes a sneak peek behind the scenes at the early developmental stages of this sure-to-be box office hit. Representing the pinnacle of concept art today, The Art of Monsters, Inc. is the only forthcoming title for the adult fan, and it will capture the attention of artists, film-goers, and special effects enthusiasts everywhere. With full-color illustrations and an accompanying full-length CD, it’s a certain smash hit! (A Read-Aloud Board Book) Don’t be scared—it’s just those two lovable monsters Mike and Sulley in a new, easy-to-read retelling of the Disney/Pixar movie Monsters, Inc.
Big Boo Rescue Join Sulley, Mike, Boo, Randall, and all their monster pals in this beautifully illustrated hardcover Picture Book. With color endpapers and a foil-stamped cloth spine, this monster masterpiece retells one of the most pivotal scenes from Monsters, Inc.! Spanish Edition Also Available Monsters really are fun, and this book proves it! Make Sulley laugh, bounce Boo in the air, or make Mike slip and trip in this all-new format! This Finger Fun book allows kids to bring their favorite characters to life, simply by moving the sliding mechanism on every spread. (Board Book) He’s big, he’s blue, and he’s furry! He’s Sulley the monster, and he’s the star of the new computer- animated Disney/Pixar film, Monsters, Inc. This board book stars the #1 scarer and features fur on its dynamic die-cut cover. Spanish Edition Also Available Children won’t be able to take their eyes off this frighteningly fun board book! Tilt the cover and Mike the monster will look up, down, and all around with his lenticular eye! (Board Book) At Monsters, Inc., there are big monsters, little monsters, furry monsters, and lovey-dovey monsters. What kind of monster are you? M Is for Monster What goes bump in the night? The monsters of Monsters, Inc., of course! Join all the stars of the latest Disney/Pixar film in this 24-page shaped storybook. My two year old loves Monsters Inc. Since we limit TV time at our house, I thought that getting him some books about the movie would be a happy compromise when he wants to watch, and I want to get him away from "the box." He was thrilled to read M is for Monster. The book is written from Mike's point of view. So it starts out with Mike at a drawing board saying, "A is for author. I write AND I'm cute." It goes on to feature several characters from the movie: Boo, Celia, George, Sully. The story itself is written in rhyme. The illustrations are simple but colorful. It's a great book. My only complaint is that it only comes in paperback. It's rather flimsy. I would love to see this as a board book. But even as-is, I think it's definitely worth the money. (Board Books) Four board books featuring Sulley, Randall, Mike, and Boo from the hit Disney feature film Monsters, Inc., in a great carry-along case. All of the characters tell of their adventures in Monstropolis, the city of monsters, from their unique points of view. (Board Books) At Monsters, Inc., there are big monsters, little monsters, furry monsters, and lovey-dovey monsters. What kind of monster are you? 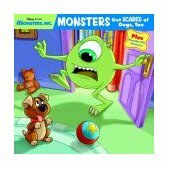 (Board Book) What’s a monster to do when he’s scared of children—and there’s a little human girl right in his living room?! Find out how Sulley, the big blue monster from the feature film hit Monsters, Inc., handles this potentially toxic situation. Die-cut and illustrated with colorful art, Good-night Board Books are perfect for story time and naptime. (Board Book) Mike, the green monster who’s all “eye” from the fantastically successful film Monsters, Inc., loves to tell jokes and make children laugh. In this amusing story, Mike drops in on a human friend for a few laughs and giggles before bedtime. Die-cut and illustrated with colorful art, Good-night Board Books are perfect for story time and naptime. Who's So Scary? Children can pet Sulley’s fur and feel Randall’s scaly skin in this Touch-and-Feel book. With a tactile element on every spread, the smallest fans can reach out and touch their favorite stars of Monsters, Inc.! (Board Book) Fans of Monsters, Inc. will love lifting all the flaps as they search for Boo, Mike, Sulley, and other characters from the hit movie. Plus, there are cool stickers included that can be applied to the pages of the book again and again! By Gail Herman Young readers will scare themselves silly with this 48-page reader featuring the adventures of Sulley the monster and his one-eyed friend Mike from the computer-animated Disney/Pixar film Monsters, Inc. Leap 2 Reading Book: Disney/Pixar Monsters, Inc.
By LeapFrog LeapPad system's unique, multisensory interface already allows kids to enhance reading skills without making it seem like work. But this book has the added attraction of featuring those creepy (but, oddly, cuddly) creatures from the blockbuster movie Monsters, Inc. While top scarers Sulley and Mike figure out that kids are fun, not fearsome, children will exercise reading comprehension, retention, and concrete/deductive thinking. They'll also enhance their vocabularies and grammar skills along the way. It's simple to use (kids insert the cartridge and book into their LeapPads, and use the attached stylus to hear information), but this system is an innovative technology that provides entertaining, effective learning, designed by a Stanford-trained reading expert. As well, the system has been credited with the TMA's Educational Toy of the Year and People's Choice awards. The books are designed to correlate with national academic standards for the grade levels they target. Two notes: Make sure the LeapPad book you get is appropriate for the child's educational level; this one should be a challenge for kids up to age 8. As well, know that some LeapBooks work on both LeapPad and LeapPad Pro, like this one, but some books only work with one system. Monsters are lurking after dark, waiting to scare sleeping children everywhere! Meet monsters Sully and Mike, the top "scare team" from Monsters, Inc. Their job is to collect the screams of children to power their monster world. Follow their fur-raising escapades as they discover that a child's laughter is far more powerful than a scream. Features: Develop reading comprehension and recall events in a story, Learn new vocabulary words and definitions, Play games that develop grammar, math and geographical skills, Engage in activities that challenge deductive reasoning skills, Overcome fear and learn that everyone is different! NOTE: "Monsters, Inc." requires LeapPad. How to Draw Monsters, Inc.
By Walter Foster Publishing Tips from accomplished Disney artists make it easy to draw the sweet, silly, and frightful characters from Monsters, Inc., including little Boo, Sulley and his assistant Mike, Randall, Waternoose, Celia, Roz, and more. Kids can follow the easy-to-follow step-by-step instructions provided to learn to draw the movie characters in a variety of moods and poses. The book includes full-color art, animation stills from the movie, fun facts about the characters, and information about how the Disney and Pixar pros develop their movies—from start to finish! Lean, Mean, Monster Machines Kids can proudly wear their favorite monster on their arms with this tattoo coloring book featuring Mike, Sulley, and the other stars of Monsters, Inc.! By Frank Berrios Join Sulley, Mike, and Boo in this 32-page tabbed coloring book, which features eight full-color tabs and loads of activities! Includes a reusable Scare a Square game on the back cover, for the future scarers of the world! Kid-Tastrophe Join Sulley and Mike, and all the stars of Monsters, Inc., in this fun-packed, 80-page coloring book loaded with games, puzzles, and mazes! Who Glows There? Everyone’s favorites from Monsters, Inc. have stepped off the silver screen and into this 32-page activity book with a page of stickers that glow in the dark. Ready, Set, Scare Packed with over 40 full-color, reusable stickers, this interactive book allows children to enter the world of Monsters, Inc. by placing their favorite characters in scenes from the film. The stickers can be used again and again–and coated inside covers provide a space for children to make up their own silly stories. May The Best Monster Win! Monsters are hidden everywhere in this coloring book featuring coin-reveal technology! Kids can rub over areas with a coin and reveal hidden images they can color! By Kiki Thorpe For kids who just can't get enough of the hilarious Monsters, Inc. from Disney and Pixar, here's a read-aloud storybook that allows them to giggle at the antics of Mike, Sulley, and Boo over and over again. The adapted version covers all the highlights, so readers who have seen the movie can relive their favorite scenes. Remember when Boo sneaks out of the gym bag at the fancy restaurant where Mike and his girlfriend are having a romantic evening? How about when Sulley finally has to say good-bye to Boo, knowing that her door will be shredded and he'll never see her again? Sixty-four pages of full-color illustrations and read-aloud text ensure a monstrously good time. Fans won't want to miss the other exciting Monsters, Inc. titles, including Monsters, Inc. Essential Guide, Monsters, Inc. Sticker Book, and M Is for Monster. By Lisa Papademetriou When you work at a place called Monsters, Inc., the dress code and sick day policies can be pretty strange. This "employee handbook" is guaranteed to keep every young monster laughing and screaming for more! While this book is fun for your 9 year old and traces the history of Monsters Incorporated, along with their corporate employment policies, it is a great gag gift for the human resources person in your life. It is set up just like the employee handbook at your company and will provide lots of smiles as your children read it to you. It is not as great for 12-year olds, but much fun for 40-year olds. By Cathy West The adventures of Sulley and Mike continue in this 80-page, easy-to-read paperback chapter book! Includes dozens of illustrations showcasing exciting scenes from the computer-animated film! By Charles Bazaldua The new Pixar/Disney film is coming to a bookstore near you! Join a host of spooky yet hardworking monsters as they pop out of closets and try to deliver scares to the children of the world. There's only one catch though - the Monsters are afraid of the KIDS! When by accident a child ends up in Monsters, Inc. headquarters, mayhem abounds! This graphic adaptation of Monsters, Inc. is sure to please comics fans and moviegoers as well! Monsters, Inc. Masks and More Children will scare up the fun with these full-color masks of their favorite Monsters, Inc. characters! Also includes a game board on the inside covers, game pieces, and frightfully fun monster facts.